Sintra Portugal Guide - Fully Updated for 2019! Sintra is a delightful Portuguese town that is situated within the hills of the Serra de Sintra. Hidden within these pine covered hills are extravagant palaces, opulent mansions and the ruins of an ancient castle. The variety of fascinating historic buildings and enthralling attractions, combine to form a fantastic tourist destination. Sintra is regarded as the best day trip from Lisbon, and a visit to this wonderful town must be included in your holiday plans. This article will provide an introduction to Sintra, by answering some of the common tourist questions, and offering links to further in-depth guides. What are the highlights of Sintra? The Palácio Nacional da Pena – One of Europe’s finest palaces, with a vividly painted exterior and an interior restored to how it appeared in 1910. The Palácio Nacional de Sintra – A gothic palace, boasting an extensive history and ornately painted ceilings. 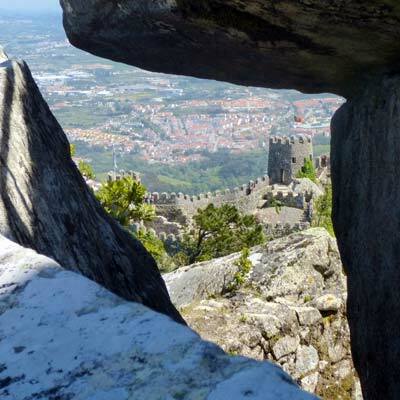 The Castelo dos Mouros – An ancient castle ruin, which offers wonderful views over the region. 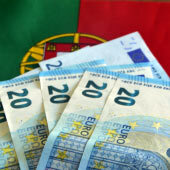 The majority of tourists visit Sintra as a day trip, either from Lisbon or the resort towns of Cascais and Estoril. 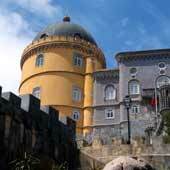 Sintra is an enjoyable day trip, which has a lot to offer visitors, and is suitable for all ages. 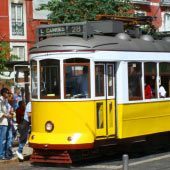 Travel to Sintra is hassle-free, as there is a regular train service between Lisbon and Sintra, or a direct bus service from Cascais and Estoril (travel details are found later in this article). Most day trippers to Sintra follow the same order, as this is the route of the 434 tourist bus. 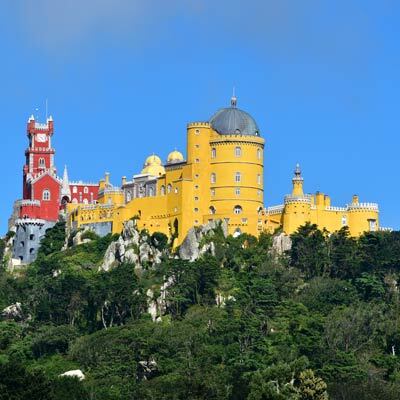 The 434 bus service connects Sintra train station to the historic centre and then climbs the steep hills to the Pena Palace and the Moorish castle before returning to the train station. Advice: Generally, we recommend Sintra as the first-day trip if you are based in Lisbon, or as the second day trip if your holiday is to Cascais or Estoril (the first day trip would be to Lisbon). 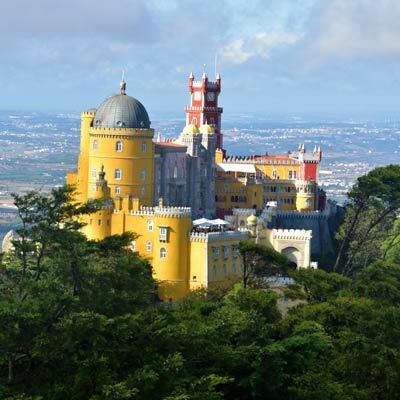 Why spend a night in Sintra? Most tourists simply visit Sintra as a day trip, but if you plan to spend two or three days exploring Sintra, it is worthwhile staying within the town. 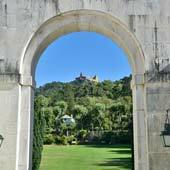 The main advantage of being based within Sintra is that the town can be explored, once all of the day trippers and coach tours have left. The key national monuments of Sintra have extending opening hours, and this allows visiting before or after the daytime rush. 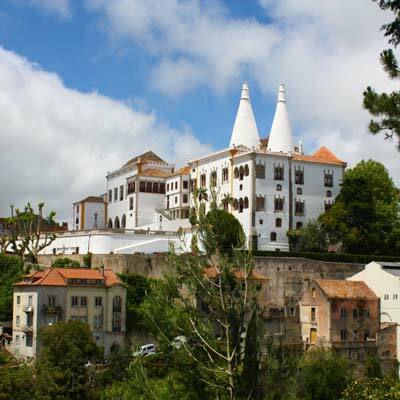 Sintra has a fantastic range of hotels, with many are in keeping with the style and charm of the region. 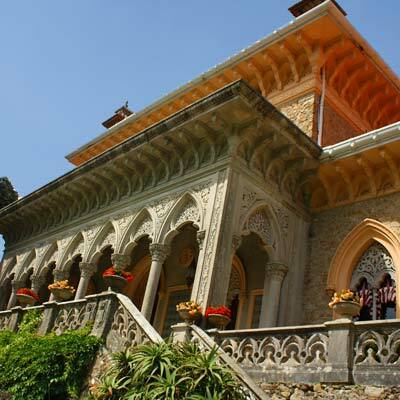 Why are there so many palaces and grand mansions in Sintra? 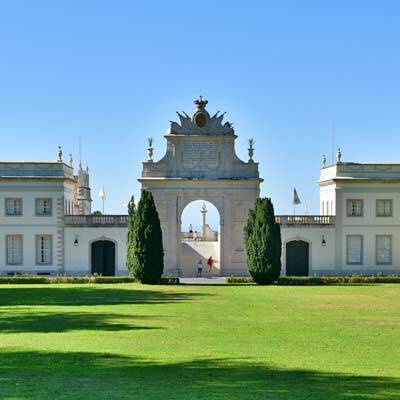 The historical reason, is due to the slightly cooler climate that the hills of the Serra de Sintra provide, this enticed the nobility Portugal to construct their summer residences here. During the 19th century, Sintra was popular a popular destination for Europe’s wealthy artisans and elite, who built elaborate mansions follow the Romanticism style of architecture. 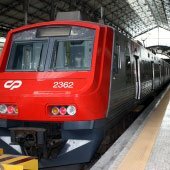 There are two regular and inexpensive train services that connect Lisbon to Sintra. The first service departs from Rossio station in central Lisbon, while the second departs from the Estação do Oriente. The train journey takes 40min (from Rossio) or 47min (from Oriente), and a return costs €4.50. The train service starts early in the morning and continues late into the night, and there are up to three departures per hour. Warning: Never drive to Sintra, the narrow hill roads were never designed for today's heavy traffic, and there is very limited car parking. In the summer there is an almost constant traffic jam as frustrated drivers search for car parking spots. 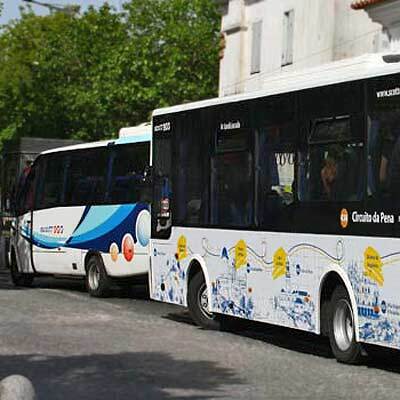 There are direct bus services to Sintra from the resort towns of Cascais and Estoril. The 417 service departs from Cascais bus station, takes 30 minutes and a single is €4.25. From Estoril, the bus service is the number 418 route, which departs from the train station and takes 30 minutes. There are a lot of benefits of visiting Sintra as a part of a small group tour. Sintra is a destination where the main tourist sights are spread across a wide region of steep hills, and a tour eliminates the hassle of public transport. 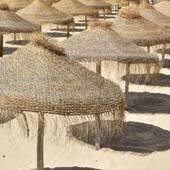 Portuguese tour guides are enthusiastic and knowledgeable, and the tours cater for more worldly visitors. 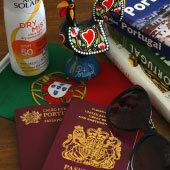 Does Sintra Portugal get crowded with day trippers? Unfortunately, Sintra can get very crowded in the summer. There can be long queues for the admission tickets, the tourist buses run out of space and there can even be long queues in Rossio station. 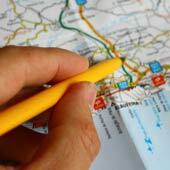 Our key advice is to start a day trip to Sintra early in the day, or else try to avoid the peak hours of 11:00-15:00. 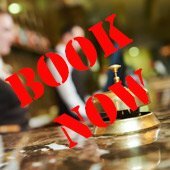 Admission tickets can be purchased beforehand (please see GetYourGuide.com) to avoid some of the queues. Another tip to avoid the crowds is to visit the Palácio Nacional da Pena in the morning, as most visitors arrive in the afternoon when following the route of the 434-tourist bus. 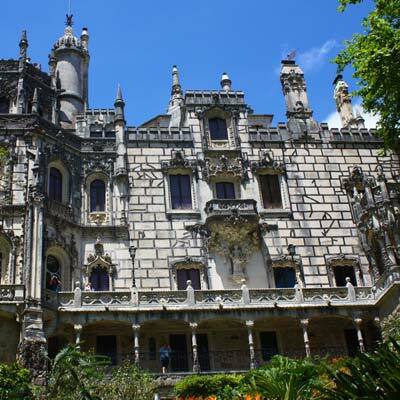 There are quieter monuments and attractions in Sintra, our favourite is the Palácio de Monserrate. 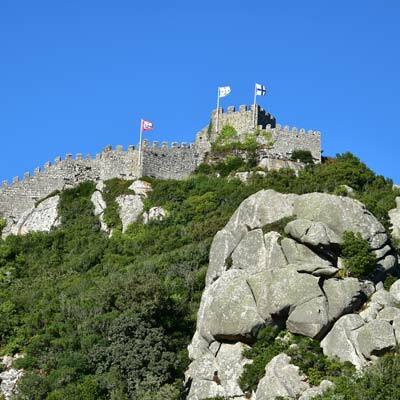 The walk from the historic centre to the Palácio Nacional da Pena and the Castelo dos Mouros is up a very steep hill and is a very challenging walk. 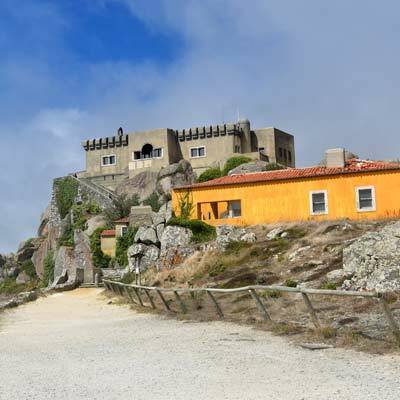 The 434-tourist bus removes this walk, as it connects the train station to the historic centre and then climbs the hill to the Palácio Nacional da Pena (Moors castle), before returning to the train station. A hop-on-hop-off ticket for the entire route costs €6.90 or a single cost €3.90. The bus departs from the front of the train station with a departure of every 15 minutes at the height of the summer season. 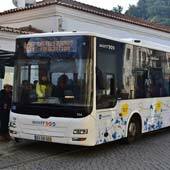 Note: The 434-bus is the cheapest and best method to explore Sintra as a day trip, we use it all the time. The 435-tourist bus connects the train station to the Palácio de Monserrate, and passes the historic centre, the Quinta da Regaleira and the Seteais Palace. This bus is ideal for the second day in Sintra. The hop-on-hop-off ticket costs €5.00. The town of Sintra is Europe’s finest example of the whimsical and colourful Romanticism style of architecture. This elaborate 19th-century design style was inspired by the love of art and the mysticism of ancient cultures, to create decorative and flamboyant buildings, of which the Palácio da Pena is the greatest example.